During this half term, Grimm & Co decided to make themselves visible to the mortals of Sheffield and beyond, by giving them the opportunity to browse and purchase from a specialist range of magical wares, evil plots, and wild schemes at our very own temporary pop-up stall in the heart of the Meadowhall shopping centre. Curious shoppers and familiar faces were encouraged to take turns on our magic-o-meter to discover whether they were magical creatures hidden in well-made disguises, or were just ordinary humans, meanwhile the shop elves devoted their time to advise the mortals about the benefits (and potential risks) of using our products, which range from the very practical to the wickedest imaginable. 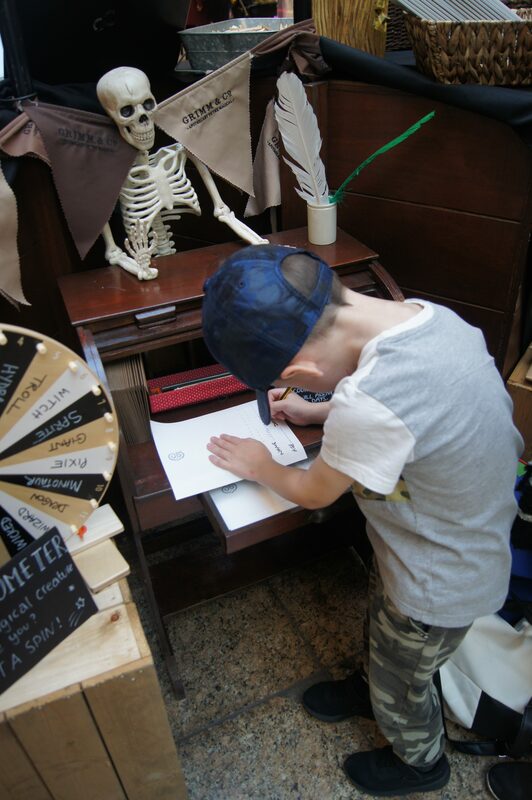 Grimm & Co also gave small shoppers the opportunity to write and send letters by first class owl post to their favourite fairytale character- a service which has grown in popularity over the centuries, since the apothecary was established back in 1148. The reaction from our customers was overwhelmingly positive during the week, with many being happy to share their positive experiences with the shop elves in regards to their recent visits to the apothecary through our free workshops and special events, whilst those who were unfamiliar with us engaged with both our products and visual displays to learn more about the work that we do within the local and wider communities and our ethos here at Grimm & Co, which focuses on changing lives one story at a time. This attracted keen interest amongst both parents and teachers in attending our creative writing workshops. We would like to give a massive thank you to all those who visited and supported us during our time at Meadowhall, and we look forward to seeing both new and returning faces visit our apothecary in the near future.